LONDON--(BUSINESS WIRE)--Technavio market research analysts forecast the global energy efficient HVAC systems market to grow at a CAGR of over 11% during the forecast period, 2018-2022, according to their latest report. This market research report segments the global energy efficient HVAC systems market based on products such as air conditioning, heating, and ventilation. The report also provides an analysis of the growth prospects of the market across various geographic regions such as the Americas, APAC, and EMEA. Most residential, commercial, and industrial buildings around the world use some form of heating, cooling, or climate control technologies for providing thermal comfort and satisfactory levels of indoor air quality. Many buildings also directly burn fossil fuels, such as heating oil, natural gas, and even coal, to provide for the space heating requirements. The energy consumed for such space heating and cooling applications in buildings and other areas represents significant cost incurred by the owner or operator. Therefore, the demand for energy efficient HVAC systems is growing to cater to the need to minimize the energy consumption in buildings and reduce operating costs. “According to the US Energy Information Administration estimates, about 1400 billion kWh of electricity was utilized by the US residential consumers during 2016, of which a significant 45% was utilized for heating, ventilation, air conditioning, and refrigeration applications. The heating, cooling, and ventilation costs for commercial and industrial users also represents a significant proportion of their overall operating cost. Thus, there is persistent demand to improve operational efficiency from such end-users, which is encouraging the increased adoption of energy efficient HVAC systems,” says a senior analyst at Technavio for unit operations research. Of the three products, the air-conditioning segment held the largest market share in 2017, accounting for nearly 67% of the market, followed by the heating and ventilation segments. Energy efficient heating, ventilation and air-conditioning (HVAC) systems are the technologies that provide the same performance as conventional HVAC systems, while simultaneously reducing the energy consumption or using renewable energy sources for operation. APAC was the leading region for the energy efficient HVAC systems market in 2017, accounting for a market share of over 37%. APAC is followed by the Americas where most of the demand for energy efficient HVAC systems is concentrated in the US and Brazil. The ongoing construction boom in the US and the growing adoption of energy efficient HVAC systems to reduce energy costs are expected to be major factors driving the demand for energy efficient HVAC systems in the region. 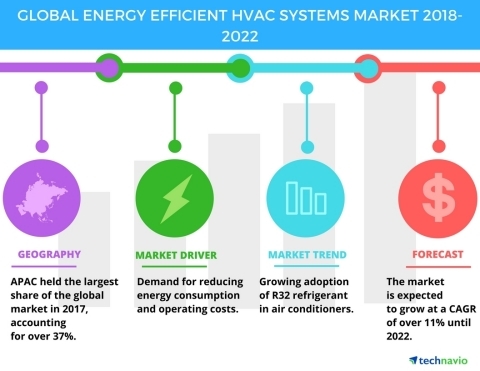 Technavio market research analysts forecast the global energy efficient HVAC systems market to grow at a CAGR of over 11% during 2018-2022.